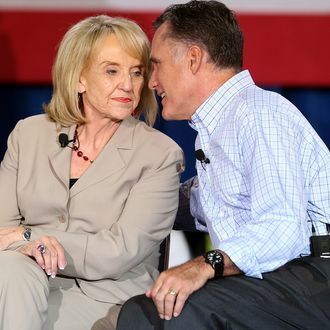 Brewer listens as Romney pushes his "gay agenda" (probably). Republicans aren’t turning against the bill solely because it’s discriminatory. They’re concerned it will lead to boycotts and bad press for the state. After tweeting his opposition over the weekend, Flake told reporters on Tuesday, “I don’t think it’s needed, and … it would be devastating economically to the state.” McCain echoed that sentiment on CNN, saying, “This is going to hurt the state of Arizona’s economy and, frankly, our image, so I hope the governor of Arizona will veto this and we move on.” Romney and Gingrich also sided with those who want to “advance the gay agenda,” as Limbaugh put it.